Our Trivia Quiz Evening has been the club's major fund raiser over the last few years and has been in 2015. 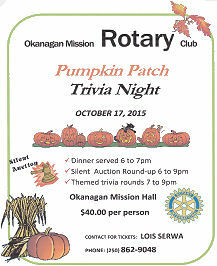 A great success it was held in the Okanagan Community Mission Hall or "Red Barn" on Lakeshore Road on Saturday October 17th. The theme in 2015 was Fall Harvest so the hall was decorated with pumpkins and autumn leaves and the event was entitled "The Pumpkin Patch Trivia Night". Settle at chosen tables and enjoy an apperitif or two from the bar. Welcome and 'instruction on the evenings procedures by the Master of Ceremonies. The meal. Created by the Creekside Pub. The Quiz. Several rounds of totally trivial questions with equaly trivial answers scored round by round and adjudicated by a select panel. The Annual OKM Grade 8 Rotary Essay is open to all Kelowna schools in School District 23 and is hotly contested. It has been run so far for seven years. For the last two years the presentation evening has been a joint meeting between of the Okanagan-Mission Rotary Club & the Capri Rotary Club held at the Coast Capri Hotel and attended by the nominated winners, their parents and supporters and the judges as well as Rotarians from both clubs. 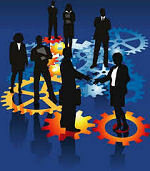 The general topic is Projects Worthy of Rotarys Attention. Each student presents their concepts at the presenrtation event and then the prizes were distributed. The topics chosen by the students are always wide ranging and vary from local to international projects. We are indepted to Bell Media who donate advertising air time to the club to sell on behalf of the Kelowna "Have a Heart charity. A one-day fundraising campaign for the Kelowna General Hospital, the Have A Heart Radiothon features a 12-hour live broadcast on 99.9 Sun FM, 101.5 EZ Rock and AM 1150 that calls upon listeners to help raise much-needed funds to support care for young patients at KGH. The money collected helps cover the costs of new specialised pediatric equipment such as SiPap respiratory machines, cast saws and casting supplies, sinuscopes and bronchoscopes. Every year, the radiothon is broadcast over Bell Media's three radio stations in Kelowna, Sun FM, EZ Rock and AM 1150. OKM Rotary sells $250 advertising slots, donated by Bell, for broadcast on the three stations and in addition presents vouchers for $250 discount on any further advertising made on Bell stations by the donor companies during the year. In 2015, thanks to AM1150, 101.5EZRock and 99.9SunFM, and all of the individuals and businesses who contributed, $84,157 was raised in the 12th Annual Have a Heart Radiothon. On Thursday, February 12 the community came together to help improve care for sick children at KGH. Over 17,000 sick children each year come through KGHs Emergency Department, Pediatric Outpatient Services and Perinatal Care  thats nearly 50 every day! Thank you to everyone who stopped by the Pear Court at Orchard Park Shopping Centre, purchased an item in the online auction or held their own fundraiser. You helped make a difference!